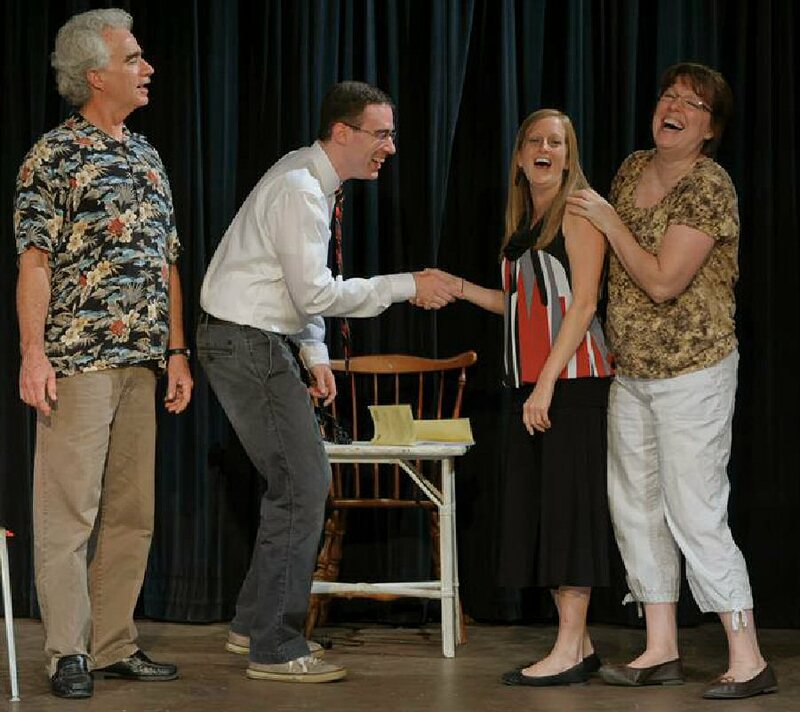 OSWEGO, NY – Talent runs in the Nelson Metz family as is evident in the Oswego Players’ next production, “Don’t Drink the Water,” by noted funnyman, Woody Allen. The production is directed by Nelson’s recent bride, Sherri Lynn Metz, who also takes on the role of his on-stage wife in this fast-paced romp. Added to the mix is Nelson’s son, Chris Metz. Sherri Lynn Metz stepped in as cast member in her own show when the person originally cast had to withdraw. This happens once in a while in an all volunteer presentation. Another actor, Zane Leo, found he needed to relocate, but luckily, Knate Roy, who did such a great last-minute job in Dr. Michael Nupuf’s, “Death in the OR,” was able to assume that role. Chris Metz caught the “acting bug” after working in backstage and technical positions for the group. The Players are fortunate to have such a talented and versatile family. Other cast members include, Brian Pringle, Joannie Anderson, Jennifer Snow, Julia Dighe and Juan Lamanna. The show is scheduled for production September 13 and 14, 20 and 21 at 8 p.m. and September 22 at 2 p.m.
Reservations may be made at the Box Office (315-343-5138). The Players are grateful for the support from Pathfinder Bank toward the Oswego Players’ 75th season productions.